Caroline Wozniacki’s love for bicycles is pretty known. The fit Danish star has been spotted enjoying the pedal cycle on a couple of occasions in the past. And, she’s at it again! 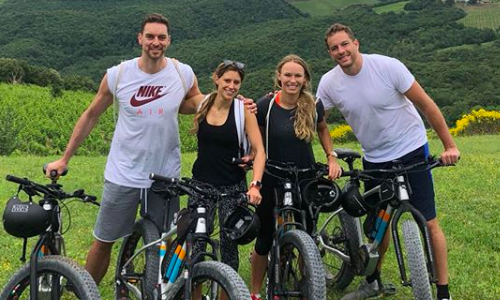 Wozniacki headed out for a group trip on a bicycle along with her husband, retired NBA player David Lee, his friend Pau Gasol, also an NBA player, and his wife Catherine McDonnell. The quartet celebrated the Global Wellness Day by enjoying a ride on the scenic foothills of Tuscany, Italy. “Bike ride thru Tuscany on #globalwellnessday #friends #lovinglife,” read the caption. Meanwhile, Wozniacki, who couldn’t go beyond the fourth round of the just-concluded French Open, is currently gearing up for the grass swing. The world No. 2 is scheduled to participate at the Aegon International in Eastbourne later this month. She will then compete at season’s third Major, the Wimbledon Championships.